Code no CT098RC: The "home-cured hams and bacon, and home-made sausages, polony and pies" were made at premises on Heptonstall Road. 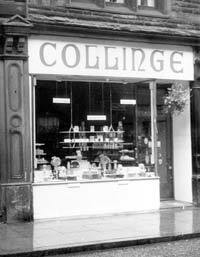 The Golden Wedding celebrations of well-known Hebden Bridge couple Arthur and Alice Collinge 50 years ago marked not only a long and happy marriage but the establishment of a family dynasty of butchers that started in the Victorian Age. Married at Slack Baptist Church on January 2 1904, Mr and Mrs Collinge had been in business in Market Street, Hebden Bridge, since 1908. Arthur, a native of Colden, became an apprentice butcher for Heptonstall Co-operative Society at the age of 14. Four years later he was branch manager. The family tradition is maintained today by Arthur's great-grandson David Woodhead, who took over premises in St George's Square in 1988.